The Future of flooding in Somerset Levels and Moors. Group updates. The performance took place in Taunton on Tuesday 17th of March 2015. It was a sunny day and it was great to be out of the office engaging with the local community in Somerset. 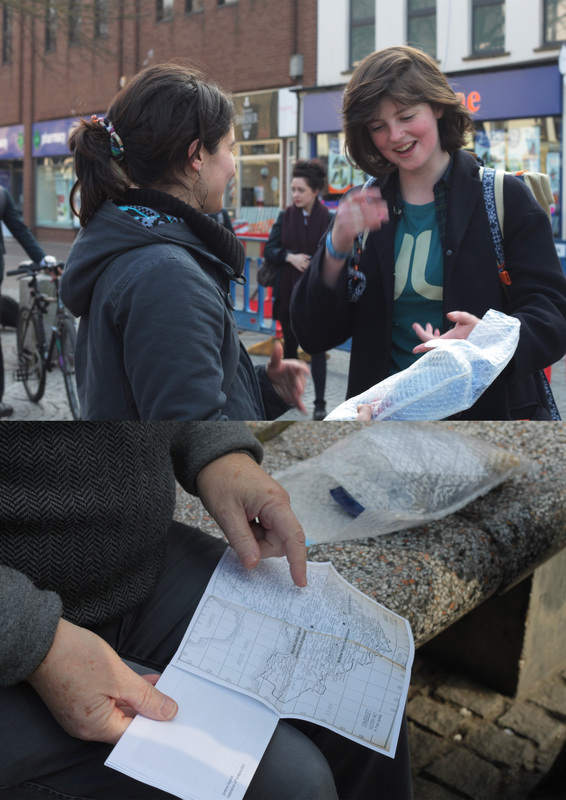 We met in the city centre and had two boxes filled up with our flood kits ready for the performance. 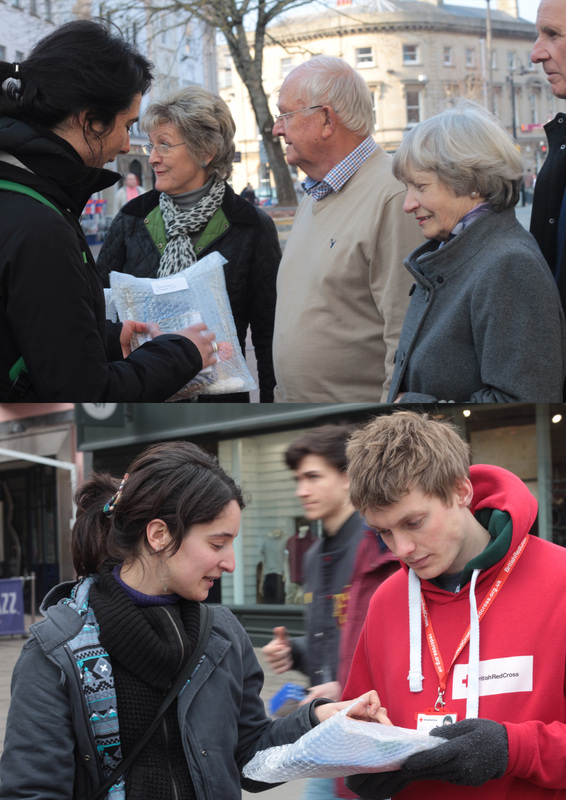 The plan was to give them away to people while engaging conversations with them about the floods and their experiences. At first, it was exciting and maybe a bit intimidating at the same time: how to approach people walking on the street? Will people be prepared to talk to a few strangers about flooding? What will they expect? What will they tell us? 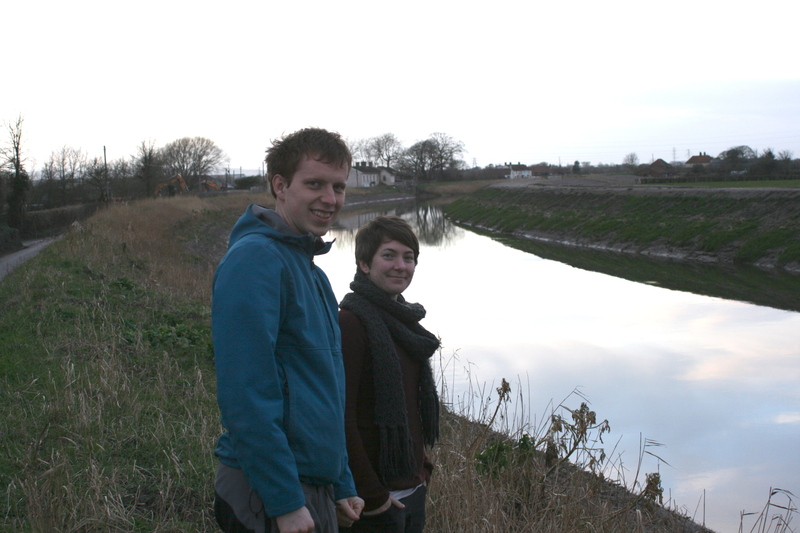 However, very soon we felt much more comfortable and giving our kits not only provided us with the chance to talk about our project, but also opened the opportunity for establishing deeper connections with the people, sharing stories and memories about floods in Somerset. One of the people we met was a middle aged guy. When we told him we wanted to talk about flooding he seemed sceptical. However, the lady next to him very excited told us he was actually the perfect person to talk to, as he had been working at the Environment Agency for over 40 years and as part of his work he had been involved with the Somerset flooding. What were the chances? We started talking about the flat landscape of Somerset, making it so prone to flooding, and the map we had included in the kit became a useful tool to discuss about the topography of the region and the most critical areas. He opened the kit in front of us examining each object and asking us further questions. At the end of our chat he told us ‘You made my day!’ which was a very amazing response for us. Another interesting conversation was that with two ladies who had not experienced flooding personally, but who helped us realise once more how flooding is significantly present in everyone’s memories, having shaped the history of the whole community. They explained how the last year’s event came as a surprise to several people as there hadn’t been extreme floods in the last years and people were not prepared. We also talked about flooding being always present in the history of Somerset. It was interesting to hear the story of a church on the Levels which has hooks outside its entrance that were used in the past to moor the boats! A lot of people seemed scared to talk to us and many did not have time to stop and chat but overall, the people we met appeared keen on participating in the conversation and their responses varied but were mostly very positive. We were happy when, talking with two girls in their 20s, they seemed interested with the overall project and told us that as their houses had never flooded, they would pass on our kit to friends of theirs who had actually experienced flooding. After we had distributed all of our kits, we were left behind with a willow cutting that someone did not know where to plant. On our walk back to the train station we saw a small corner flower shop and we immediately walked in. After explaining the project and talking with the florist about the floods we immediately realised that we had found the perfect person for our left over willow. She explained to us that her and her son grow willow in Taunton and make real size animals out of willow. The work is continuing to gather pace as the exhibition approaches. We are all working furiously to test our ideas and make sure everything is ready for the show. My initial concerns regarding how the collaboration would work due the constraints of physical distance have been allayed as the group have fitted into a regular exchange of information and ideas via email. However, this exchange of information led to me being provided with numerous interviews and recordings regarding the flooding, which I have spent the last few days going through to finalise our sound installation. It seems to me that there are many conflicting views over the management of the levels and I seem to struggle to find a definitive answer to the question of dredging, something I intend to question the rest of the group over. I will let you know their thoughts. Our group were extremely lucky to be invited to Moorland to talk to Janet Winslade and her son James about the effect that the flooding had upon their lives. Janet has lived in her home for 50 years and in that time has never had her home flooded which meant that the events of the last 12 months have been extremely difficult for her and her family. I have spoken to Janet about her experiences before but it is always the details that surprise me. In my experience it has taught me that many of us make conclusions about what must have happened but in reality we really have not idea of the reality of the flooding or what challenges still face the communities. I was hoping that the meeting would have the same effect on the rest of group and I was really pleased to see that the encounter left all of us with a far deeper understanding. I think the experience is also helping to shape the work. Josie is still working tirelessly on her illustrations but her latest drawing, which is shown below, really demonstrates the effect that, hearing first hand, how the flooding affected the community has on the work. You will see Josie’s uses many of the facts we heard. Janet told us that the water came across the land from the west and high winds resulted in damage to the buildings, which is referenced on the right of the drawing. James telling us that the insurance companies disputed whether flooding or storms, referenced on the top left, of the illustration, caused the damage also fascinated us. Each time I look at Josie’s work I can see more and more of Janet and James’ story. Post written by Andrea Oke, Josie Ashe and Laurence Hawker. 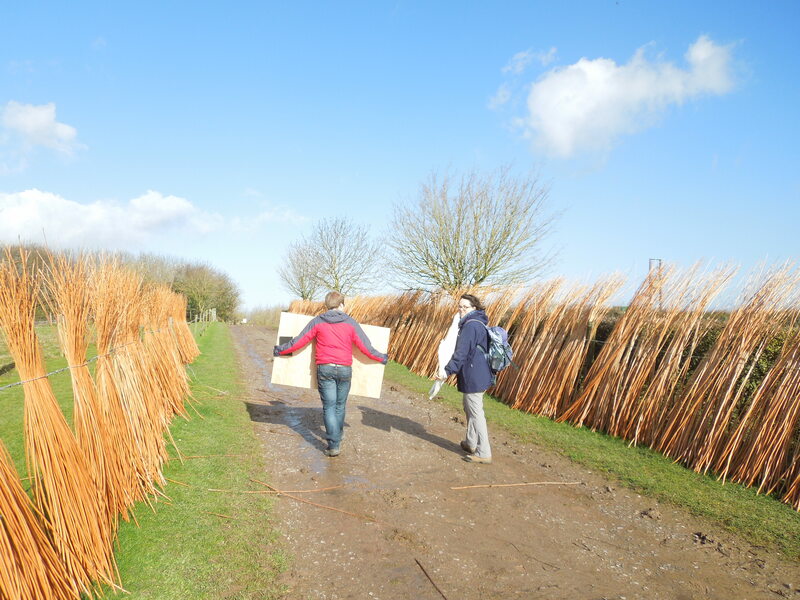 On 2nd March 2015 Deborah Westmancoat took the two of the students working with recent flooding to the Willows and Wetland Centre in Stoke St Gregory. 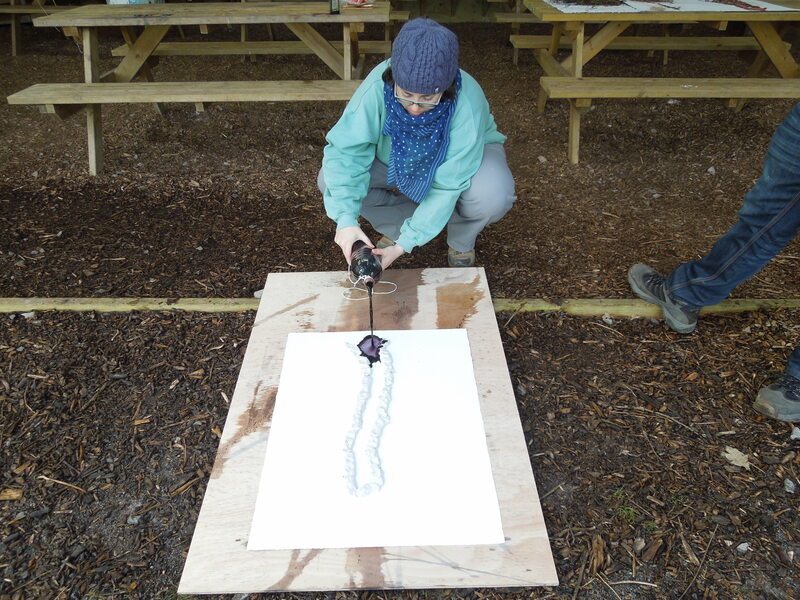 The aim was to learn more about how this particular area was affected and to make some site responsive artworks using materials collected from the area. 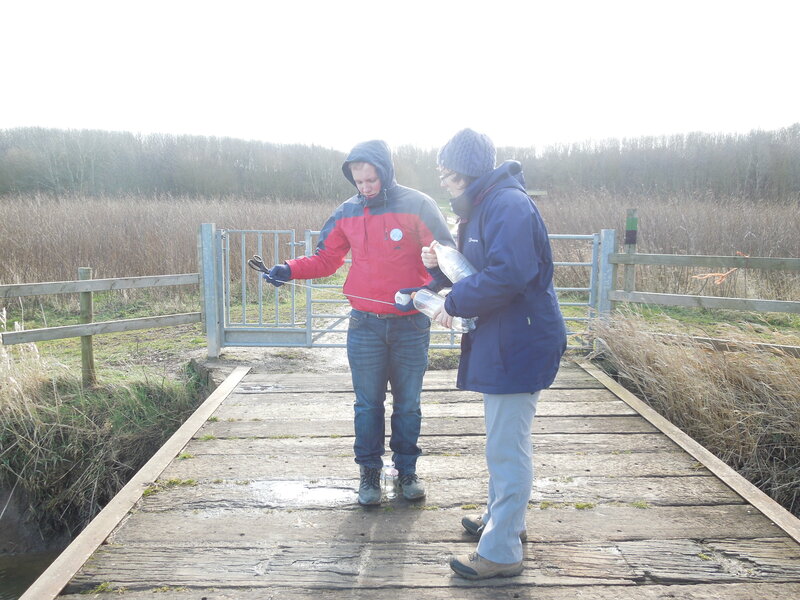 Despite the chilly winds, Olivia Cooke and Dave Glover threw themselves into the project with great energy and interest, starting with a useful conversation with Nicola, one of the staff at the Centre, about how the floods were perceived locally and how the surrounding land had been affected. They also discussed ways of potential land management, including the planting of Willow. The Centre kindly donated some materials for the students to use in our artworks. 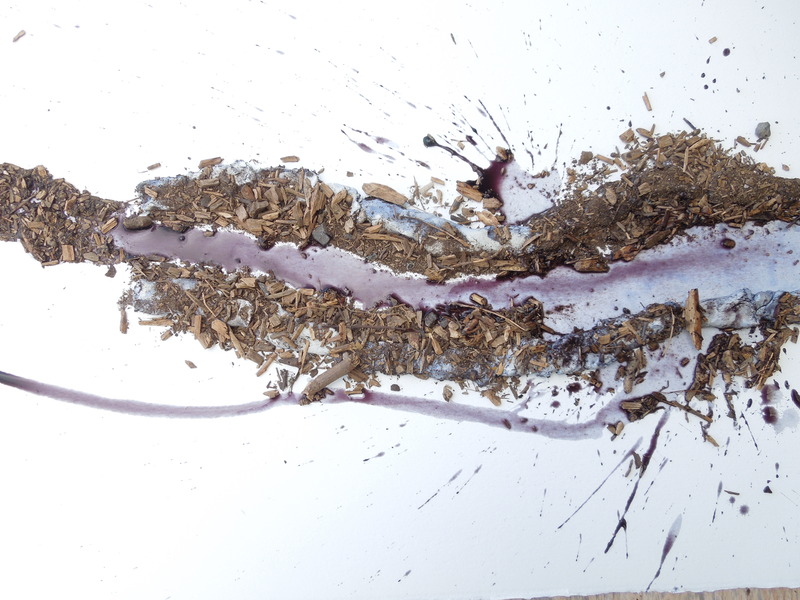 We found out that art keeps the Centre going – artists charcoal made from their Willow beds being their most significant export! The centre kindly allowed us the use of an outdoor classroom overlooking The Levels for the day. As soon as we had moved our kit onto site we started collecting materials from the ground, withy sticks and water from the River Tone to use in the works. Nobody fell into the river…but it was a close call at one point! After some initial discussion and trials our art started to take shape. Following on from ideas initially presented by fellow student, James Webber, we manipulated our gathered materials on the paper sheets we were working on to represent various flooding scenarios. 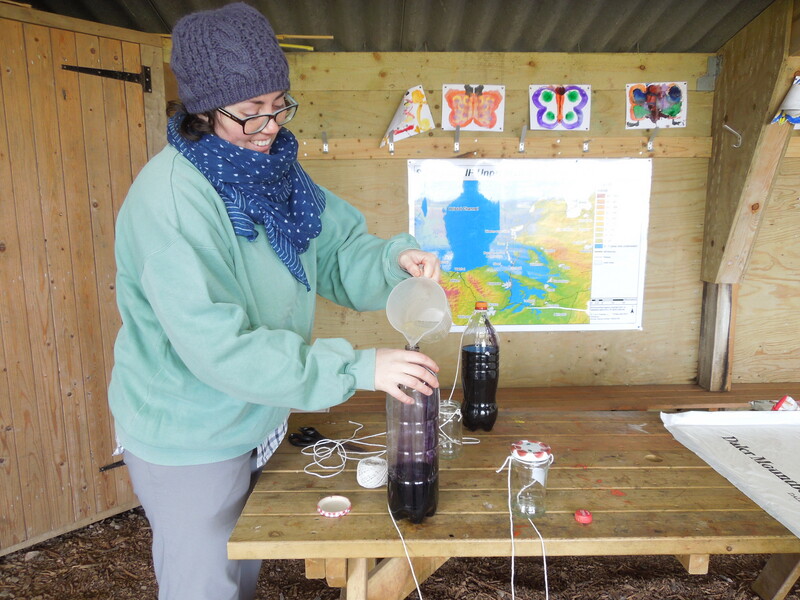 We added writing ink to the collected waters, and this was rained or tidally flooded into the various topographic elements to ‘write’ the story of how water reacts in different situations. We all agreed that the finished pieces are very striking, and were interested to see just how well the ink/water images represented the different hydrological scenarios so well. 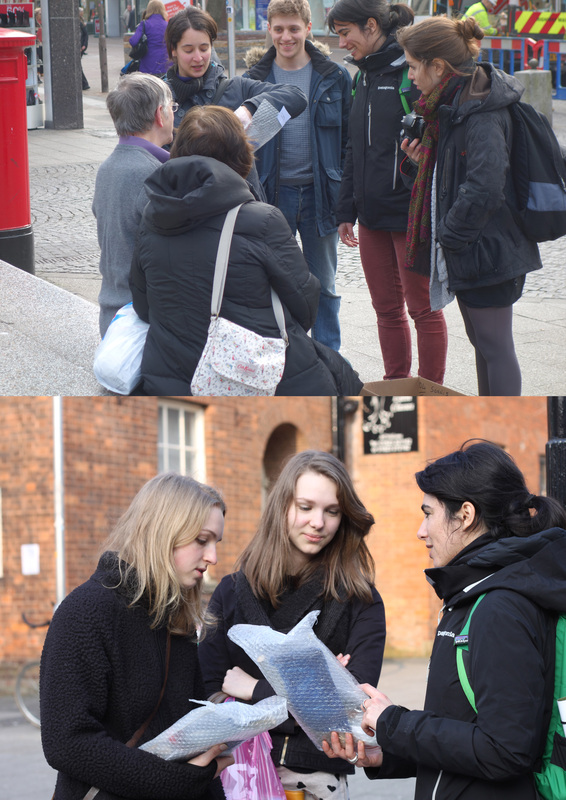 The making of the work led to some interesting observations and discussion between the group. Olivia Cooke felt that the project made clear to her that “…you have to be able to communicate science as well as being a good scientist”.